A mango that resembles an apple or smells like grapefruit. A mango that shrinks, but does not rot. But for the conservation initiative of a farmer in Karnataka’s Mandya district, such fruits would have been part of folklore. “These trees bear Tipu Sultan’s mangoes,” says Syed Ghani Khan of Kirgaval village pointing to the foliage in his eight-hectare farm. The 18th century ruler had an army station in Kir-gaval. Folklore has it, when Tipu decided to disband the regiment, he gave the land in and around the village to his soldiers. 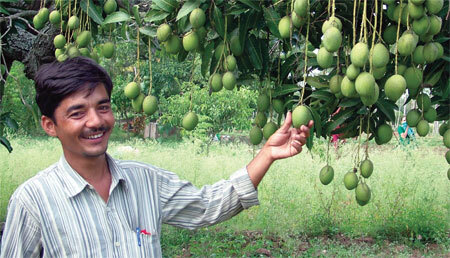 At that time Kirgaval was known for 300 to 400 exotic mango varieties. Things started changing 150 years ago after the construction of Krishnaraj Sagar dam. Irrigation replaced millets with paddy. Mango trees were cut, first to make space for paddy, and then to fuel brick kilns to meet the rising demand of brick houses. Today, except for some 116 rare mango trees surviving in Ghani’s farm, Kirgaval is as faceless as any paddy growing village in the area. “My grandmother, who had inherited this piece of land,” says Ghani, 34, “wanted to save these trees, each of which is a different variety.” Most of them are 100 to 200 years old, he adds. Ten years ago when Ghani started looking after the farm, he did not know how to conserve the trees. But he was bent on finding a way out. Enquiries with the local Krishi Vigyan Kendra and agriculture universities brought no results. In 2006, Ghani came in contact with an organic farming group called Sahaja Samruddha. Through the group he met agriculture scientist and writer Devinder Sharma. He advised him to first register his varieties with the National Bureau of Plant Genetic Resources. Though the local names of most mangoes were lost with his grandmother, Ghani does remember a few. “The mango smelling like a mosambi is called ‘mosambi ka aam’, the one that looks like an apple is called ‘seb ka aam’.” There are other varieties too, like “moti ka aam”, “aate ka aam”, “meethe mian pasand” and “nanhe mian pasand”, he adds. His own favourite is “manjhe bi pasand”, the mango that shrinks with time. “It is exceedingly sweet and has a shelf life of 15-20 days after it is fully ripe,” says Ghani. He has also named some varieties after friends and people who helped him register them. There is one after G Krishna Prasad, director of Sahaja Samruddha. IIHR plans to do detailed analysis of a greater number of varieties. But not all the farmers are interested in mangoes. They see paddy as the best cash crop. “In my village, 15-20 old trees are still surviving on people’s farms but are in a state of neglect,” rues Ghani.